Sunday's the big dance in Chicago--at least for 45,000 runners who've had October 11's Chicago Marathon marked on their calendars since April--but the fun gets started on Thursday, October 8, at Niketown with its annual pep rally. And this year's pep rally, kicking off at 6:30 p.m. at Niketown at 669 N. Michigan Ave., has a star-studded cast, including Nike elite athletes and Chicago Bears' Johnny Knox. 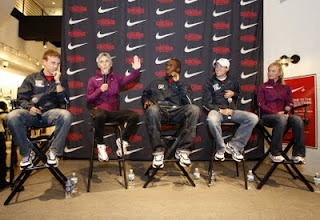 Have a question before race day and want a seasoned pro's advice? Want to know how Olympic runners attack a race? Need to squeeze in a last minute run and want a great course along the Lakefront Path and elite company? Or just want to run? The pep rally delivers with Johnny Knox, considered a Bears speedster, plus Nike elite athletes who include: Joan Benoit Samuelson (winner of Chicago Marathon and Olympic Gold winner), Bernard Lagat (2008 Olympic Silver, Bronze winner), Shalane Flanagan (2008 Olympic Bronze winner), Matt Tegenkamp (American record-holder: 2 miles), Chris Solinksy (14-time All American) and Anna Willard (2-time national champion). They'll be on hand to advise and cheer on local runners and then head out for a training run after a Q&A session. Then come Sunday they'll be cheering on the high schoolers competing in the Nike Northside/Southside Challenge, the first-ever high school invitational meet taking place on the Chicago Marathon course, during the race itself.